Any plant that offers cheer during the winter months is appreciated. When one thinks of winter interest, evergreens, berries, and bark generally come to mind. Flowers? Not usually, unless you are familiar with Mahonia x media. Several cultivars, crosses between Mahonia lomariifolia and M. japonica, bloom during December. Mahonia was named in honor of Philadelphia horticulturlist Bernard McMahon who is credited for introducing the plant from materials collected during the Lewis and Clark Expedition. Some 70 species make up the genus, including the Northwestern native Mahonia aquifolium. This evergreen shrub typically reaches 8 to 15 feet in height. Dark green leathery leaves, found on the top half of the plant, are composed of an odd number of individual leaflets. Flowers range in color from lemon to bright yellow and are held in rigid racemes at the end of branches. Some cultivars, particularly ‘Lionel Fortescue’ are noted for being fragrant. Bright blue fruit follows. Literature states that the berries are edible, sharp in taste, and especially high in vitamin C.
Like many members of Berberidaceae, mahonia possesses a bright yellow inner bark. The color is due to an alkaloid known as berberine. In earlier times, barberry species were harvested to dye wool, leather, and cloth. Berberine is currently being studied for its beneficial health effects and shows promise in reducing cancer growths, lowering cholesterol levels, and overcoming insulin resistance. 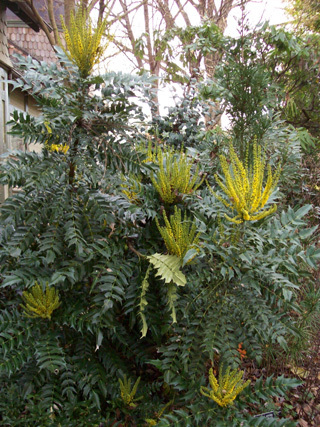 Michael Dirr praises mahonia for its adaptability though advises siting in partial shade for optimal performance. 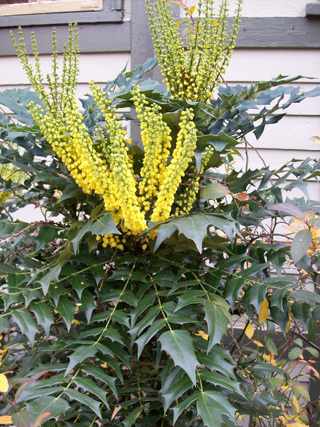 A low maintenance shrub, Mahonia is noted for several tolerances, including deer, rabbit, drought, and pollution. Mahonia looks especially well when combined as part of a mixed border, providing a green background during the warmer months, and then taking center stage during the winter. Cultivar differences include degree of yellow in flower coloration, position of racemes, and presence of fragrance. ‘Charity’, ‘Lionel Fortescue’, ‘Underway’, and ‘Winter Sun’ can be found on display at the Scott Arboretum (credit lorna). 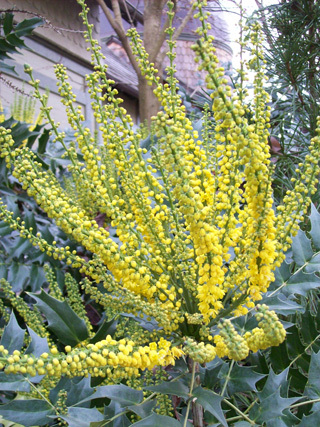 Hardy in zones 6 – 9, Winter Sun Mahonia is guaranteed to make the winter brighter. 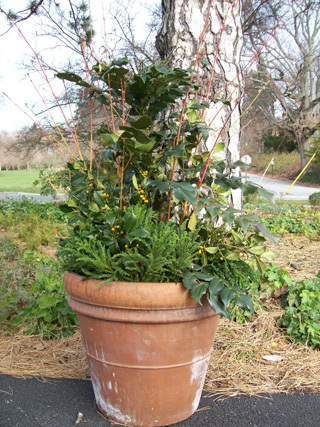 Great winter plant, nice review, thanks.